Gallia Academy senior Cole Davis (44) picks off a pass during a Week 2 football contest against River Valley at Memorial Field in Gallipolis, Ohio. Last Week: River Valley lost to Nelsonville-York 54-28, in Bidwell; Meigs defeated Vinton County 27-21 OT, in McArthur. Last meeting between the teams: Sept. 22, 2017. Meigs won 45-28 in Bidwell. Current head-to-head streak: Meigs has won 14 straight. RVHS offense last week: 213 rushing yards, 100 passing yards. MHS offense last week: 112 rushing yards, 269 passing yards. RVHS offensive leaders last week: QB Jordan Burns 6-of-13, 100 yards, 2TDs; RB Layne Fitch 7 carries, 68 yards; WR Brandon Call 2 receptions, 55 yards, 1TD. MHS offensive leaders last week: QB Coulter Cleland 16-of-36, 249 yards, 1TD; RB Zach Bartrum 15 carries, 48 yards; WR Ty Bartrum 5 receptions, 39 yards TD. RVHS defense last week: 189 rushing yards, 201 passing yards. MHS defense last week: 241 rushing yards, 0 passing yards. 1. The last time River Valley defeated Meigs was Sept. 5, 2003 in Cheshire. In the 14 meetings since then, MHS has outscored the Raiders by a 556-to-215 margin. The Marauders are 21-3 all-time against the Raiders. 2. Both sides of the ball set season-highs for the Marauders last week. The MHS offense posted 381 yards, the third time its eclipsed 300 this season, while Meigs’ defense held VCHS to 241 yards, the second time its held an opponent below 250. 3. The Raider offense had a season-best 313 total yards last week, surpassing its previous season-high by a 144 yards. However, the 390 yards allowed by the RVHS defense is the second most of the season. 4. This season the Silver and Black have scored three rushing touchdowns and two passing touchdowns. The Marauders have rushed for five scores, thrown for 10 touchdowns, and scored once on defense this season. 5. RVHS is one of six teams in Region 19 that has yet to record a win. Meanwhile, Meigs is joined by seven other Region 15 teams with one victory on the year. Last Week: South Gallia lost to Trimble 32-0, in Mercerville; Eastern lost to Waterford 36-6, in Waterford. Last meeting between the teams: Sept. 22, 2017. Eastern won 40-20 in Mercerville. SGHS offense last week: 40 rushing yards, 23 passing yards. EHS offense last week: 31 rushing yards, 67 passing yards. SGHS offensive leaders last week: QB Tristan Saber 3-of-5, 23 yards; RB Kyle Northup 16 carries, 22 yards. EHS offensive leaders last week: QB Conner Ridenour 5-of-15, 45 yards, 1TD; RB Blake Newland 7 carries, 20 yards; WR Isaiah Fish 1 reception, 15 yards, 1TD. SGHS defense last week: 289 rushing yards, 96 passing yards. EHS defense last week: 115 rushing yards, 114 passing yards. 1. In all-time meetings between EHS and SGHS, the Eagles hold an 13-6 edge with a 582-to-302 scoring advantage. Eastern is 7-2 at home against the Rebels, with South Gallia’s last trip to East Shade River Stadium resulting in a 40-15 EHS victory on Sept. 23, 2016. 2. This is Eastern’s homecoming game. The Eagles have lost five of their last six homecoming contests, with the Rebels’ 2016 loss accounting for the only EHS victory in that time. 3. The Rebels held unbeaten Trimble to six points in the first half of last week’s game. In total this season, SGHS has allowed 47 points before the half and 46 after halftime. SGHS has scored 34 points in the first half, while scoring 31 in the second half. 4. The second quarter has plagued the Eagles this season, with opponents scoring a combined 82 points in the period. EHS has allowed an average of a touchdown per game in each the first and third quarters. Eastern has outscored opponents 12-to-8 in the fourth quarter. 5. 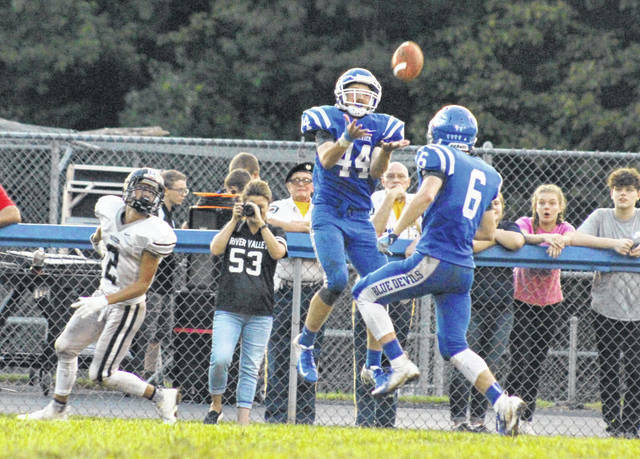 Eastern is one of seven teams in Region 27 that has yet to crack the win column, while South Gallia is one of seven others in the region to have just one win entering Week 4. Last Week: Gallia Academy defeated Chesapeake 55-20, in Chesapeake; Portsmouth defeated Rock Hill 28-14, in Portsmouth. Last meeting between the teams: Sept. 22, 2017. Gallia Academy won 36-35 in Gallipolis. GAHS offense last week: 426 rushing yards, 99 passing yards. PHS offense last week: 345 rushing yards, 19 passing yards. GAHS offensive leaders last week: QB Justin McClelland 7-of-13, 99 yards; RB Justin McClelland 12 carries, 90 yards, 3TDs; WR Cory Call 4 receptions, 35 yards. PHS offensive leaders last week: QB Danny Lattimore 3-of-7, 19 yards; RB Talyn Parker 22 carries, 291 yards, 4TDs; WR Bryce Wallace 2 receptions, 16 yards. GAHS defense last week: 201 rushing yards, 56 passing yards. PHS defense last week: 177 rushing yards, 47 passing yards. 1. Gallia Academy holds a 18-11-1 all-time record over Portsmouth. GAHS has won five of the last six meetings between the foes, with a 45-14 Trojans victory at PHS on Sept. 23, 2016 as the lone Blue Devil loss in that span. 2. Last week, the Blue Devils posted 525 yards of total offense, the most since Week 8 of last season. GAHS hadn’t eclipsed the 400-yard mark on the ground since Week 2 of the 2017 campaign. 3. The 55-point performance against CHS is Gallia Academy’s highest total since putting 55 up against Fairland in 2014. GAHS has already scored at least 40 points in a game three times this fall, matching last year’s total. 4. The last 12 GAHS touchdowns have come on the ground. The Blue Devils have rushed for 19 scores in total this year, while passing for three and scoring once on special teams. 5. GAHS is one of nine teams in Region 15 that enters the week with a winning record, while Portsmouth is one of 10 teams in Region 20 that begin Week 4 above .500. Last Week: Southern defeated Miller 58-13, in Racine; Belpre defeated Wahama 41-22, in Mason. Last meeting between the teams: Sept. 22, 2017. Southern won 41-14 in Racine. SHS offense last week: 177 rushing yards, 262 passing yards. BHS offense last week: 440 rushing yards, 0 passing yards. SHS offensive leaders last week: QB Logan Drummer 13-of-20, 252 yards, 6TDs; RB Logan Drummer 9 carries, 82 yards, 1TD; WR Trey McNickle 3 receptions, 74 yards, 3TDs. BHS offensive leaders last week: RB Jesse Collins 18 carries, 348 yards, 5TDs. SHS defense last week: 92 rushing yards, 111 passing yards. 1. Since joining the TVC Hocking, Belpre is 3-5 against Southern. The Tornadoes won in their last trip to Belpre, defeating the Golden Eagles by a 34-18 count on Sept. 23, 2016. 2. This is the first time Southern has scored 50-plus twice in a season in over two decades. The 58-point outburst by Southern last Friday is the most by an SHS squad since Week 7 of the 2013 season, when the Tornadoes scored 60 at Miller. 3. Through four games, Southern has allowed four touchdowns, two rushing, one passing and one on special teams. Meanwhile, the Tornadoes have scored 27 touchdowns, 11 passing, 11 rushing, three on special teams and two on defense. 4. Southern enters the week as one of five undefeated teams in Region 27. Meanwhile, Belpre is among four teams in Region 23 that enter the week with a .500 record. 5. To this point in the season, both Belpre and Southern share two common opponents in Miller and Wahama. The Tornadoes blanked the White Falcons by a 43-0 count and then defeated MHS by 45 last week, while Belpre earned a 36-19 win over Miller in Week 3 and then won by 19 at Wahama last week.